﻿I've decided to go to Stitches West next weekend, which has motivated me to use up the last few skeins of luxury yarn I bought there last year. 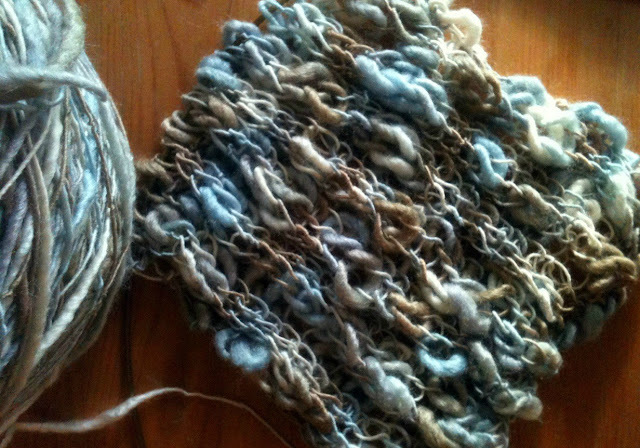 Yesterday I began knitting the above ribbed scarf using Ellie, a thick/thin slub yarn made of silk and wool. I'm still undecided about whether I like the scarf or not, but the yarn itself is lovely to work with. Below is a photo of how it looks in a skein-- I never dreamed it would knit up the way it does, with such an extreme texture. It's been a sweatpants, take-out food, restful kind of holiday weekend. I went out of my way to finish all my household chores last week so I wouldn't have to spend any time cleaning (or feeling guilty about not cleaning) over the weekend. Instead I used my time to do something far more enjoyable-- I finally watched Downton Abbey. Oh. my. goodness. I am hooked! And I still have two more episodes of season one to watch and then all of season two. Now I know what all the fuss is about. I just don't want it to end. I'm off now to scrounge up some dinner and then watch one of my other favorite shows, The Voice. Hope you have a great week. Great to hear that you had a restful weekend. I love the scarf, it has such great texture! Stacy, what is not to like?! The texture is beautiful; very rich looking. It's definitely not an I've seen that ribbed scarf before. The yarn gives a classic rib pattern a great new look! Enjoy your next yarn shopping adventure. Can't wait to hear about it. Sounds like a great weekend and I love your scarf. It's just beautiful! I've seen yarn like this and wondered how it would knit up. The photo looks lovely. And good for you for busting through your stash! Beatiful yarn Stacy. I know you are excited about Stitches. I am going this year to Stitches South and can't wait! My sister keeps telling me to watch Downton Abbey, she says it's wonderful, now you say you love it too so I really must watch it soon. WooHoo -- Welcome to the Downton Abbey fold LOL! And how exciting -- you still have season 2 to look forward to. (The end of the season is better than the beginning, so hang in there.) That yarn is beautiful. Have fun at Stitches West! I think it is beautiful! Love the texture! Have a blessed day my friend, HUGS! Oh yay! So glad you like Downton. It will leave a void in my Sunday nights! I'm getting through Larkrise to Candleford, though. The yarn is gorgeous! I'm not sure the rib shows off the beauty of the yarn, though. 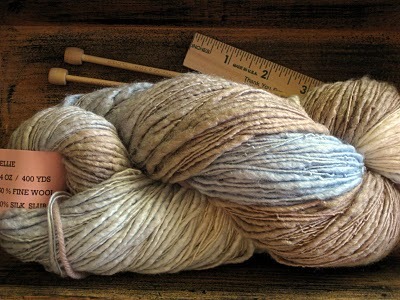 I have not worked with slub type yarns, so can't offer any advice. So lucky to go to Stitches! Have a great time! Season 2 on pbs.org. DA is pretty darn easy to get hooked ! ! I love your scarf ! ! It's going to be a lovely, wearable knitted goodness.